The solar module receives the sunlight and produces direct current (DC). We install solar modules from EOPLLY. EOPLLY is a chinese market leader in the solar module sector and offers high quality during the fabrication process using the same methods and machinery as german producers do, and that results in a high value endproduct. The team of EnergyFTP have installed more than 20.000 modules from EOPLLY from 2008. The material is working even better than expected and we have experimented the efficiency and service of the post-sales service from EOPLLY. 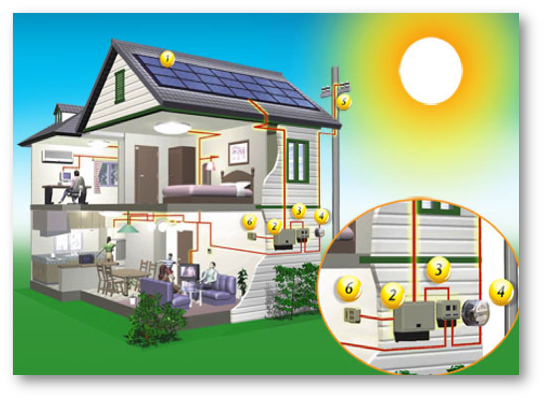 The micro-inverter transform the current from the modules from direct current (DC) to alternate current (AC) which is available to be used at home. ■Enphase Microinverters allow each solar panel to operate independently and control the power from each with 99.6% accuracy. ■This results in a significant increase in the performance of the entire system. Conection between the installation and the safety breakers in the meter room. The metering must be able to accumulate energy units in both directions or two meters must be used. Many meters accumulate bidirectionally (some systems use two meters).